I was searching for a savoury recipe to use up my almond pulp from my almond milk and stumbled across this recipe by Sarah Wilson which seems to have a bit of a cult following. I was intrigued by this 'bread' as i'd never made anything quite like it. 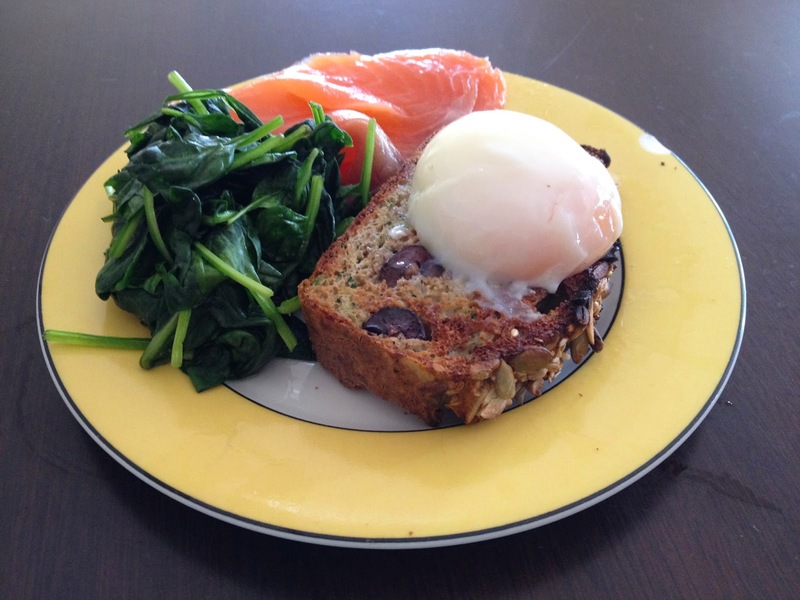 I wasn't quite sure how almond meal, arrowroot, eggs and leaveners could end up with bread. The result - well it isn't quite bread, sort of a cross between zucchini slice and a dense bread. It does taste eggy so I thought it would work well for breakfast. Without the olives, parsley and cheese, it would taste even eggier I assume. I teamed it up with some smoked salmon, sauteed baby spinach and a 60 degree egg. It was a delicious lunch but i'm not sure if i'd make the bread again. It's a good GF bread in terms of its moistness, but it is seriously dense and heavy. 1 slice is more than enough!